Buying some peppers in our Farmer’s Market last Friday has lead me on a long journey down memory lane – which has had many emotional twists and turns that, while tinged with sadness to remember the most amazing time in my life, has brought back such a wonderful memories – and, as an added bonus, the family got a good feed out of it and we all get to go to the Veneto region of Italy for a few moments! How did the concert come about? It was a tumultuous, but hopeful, time in Europe – the Berlin Wall had come down the previous November – Germany was unified – and the 40 year cold war with Russia was over AND Nelson Mandela had finally been freed from his incarceration in South Africa. This was a concert to celebrate the unification of Europe and proceeds to go to the UN Refugee Fund. Princess Diana (looking stunning in pink) was the guest of honour, Pavarotti the tenor, Sharon Sweet soprano, Dolora Zajick mezzo, Paul Plisshka bass, Lorin Maazel the conductor, and the Moscow Philharmonic (all 100 members of them) the orchestra. I was part of a choir of 3,000 – yes 3,000 – the World Festival Choir. A concert of this magnitude had never been attempted before, and believe me, after the first rehearsal, I had serious doubts that we would be able to pull it off. The choir was so far away from the orchestra that we were hearing them with delay – so we could not rely on the music to guide us. We had to memorize the whole score and just watch the conductor – maestro Maazel – listen to each other and ignore the music we were hearing – not an easy task. Maestro Maazel had a big meltdown after the first rehearsal shouting at everyone that would listen that “this was just not going to work”. At that point Pavarotti approached the assembled musicians and choristers and told Mr. Maazel that “of course it will be alright on the night – everyone had come from half way round the world to make it right – and we were not machines – we had 3,000 collective brains to MAKE SURE IT WAS RIGHT”. You don’t know how happy that made us – he was my hero from that moment on. I ate a version of this dish for the first time in a memorable trattoria outside San Gimingano, Tuscany, after it was all over, and I’m happy to share it with you. I have made it many times since – a real family favourite. 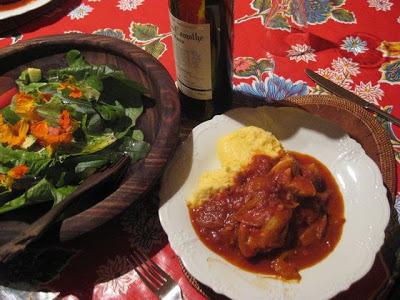 I served it this time with polenta – but great just with some crusty bread and an honest salad. 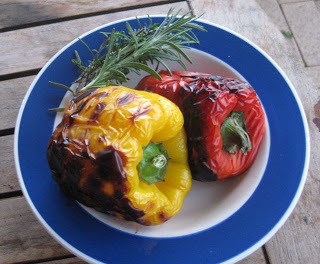 1 red and yellow pepper (capsicum) roasted to remove skin. I do this on the barbecue, but you can do it under the grill in a conventional oven. It’s a rustic dish with few ingredients, but tastes really good – wholesome and hearty. 1. Heat oil in large, deep frypan and brown chicken pieces (the skin needs to be crispy) – about 10 mins., seasoning well with salt and pepper. 2. Remove chicken from pan and saute onions and garlic in same pan until soft. 3. 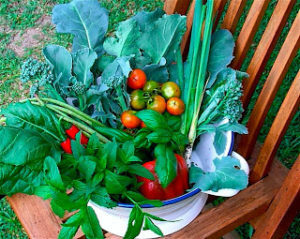 Add tomato, herbs, salt, pepper and peppers that you have skinned, deseeded and cut into strips. 4. Place chicken on top, skin side up, and cook for further 30-40 mins. on low heat. 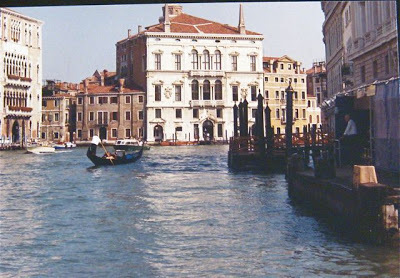 Venice – arriving by boat! * Finally arriving at our hotel near Padova at the spa town of Galzigano Terme and the mostly Austrian and German guests – plus the local staff finding us Aussies a complete mystery (thinking we must also be Austrian) – the Northern Italians, unlike the Southerners, had no cousin or uncle in Sydney. 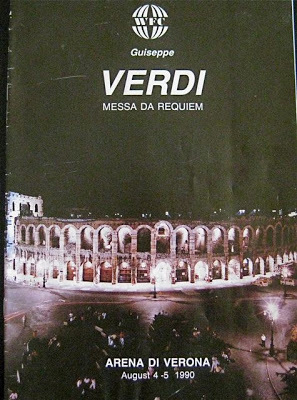 Why were we coming to sing in Verona? Did we have churches in Australia? What language were we speaking? 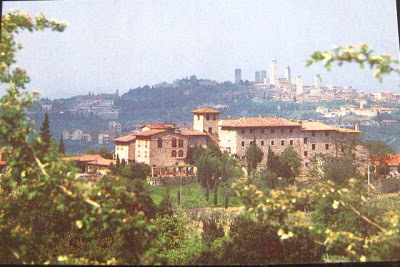 Mind you we thought the guests activities pretty strange – they would arrive at breakfast in matching tracksuits straining over their big bellies and backsides, eat a mountain of boiled eggs and salami and then go into the bowels of the hotel for well – bowel treatment!! Us Aussies were told off for doing laps in the pool – (it was just for taking ze waters i.e. bobbing up and down) – and the youngsters doing the ubiquitous shark alarm swim up and down the pool with dorsal fin – not funny! * Everything changed after the night of the first concert – which was televised live across Italy – they finally got it. When we arrived back at the hotel, in the wee small hours of the morning, whatever staff were still there lined up to meet the coach with a big bunch of flowers, applause and shouts of ‘bravo’. 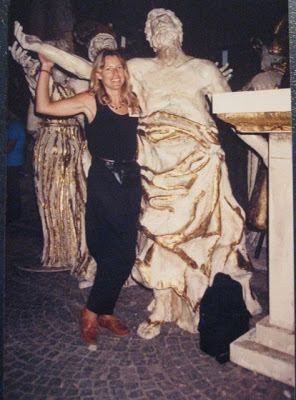 * Rehearsing whenever the Arena de Verona was free – which usually meant in the scorching midday sun or after concerts at night – which was exhausting. Us Aussies were amazed to find that most of the choristers – particularly the Scandinavians stripped off to their bikinis (or underwear) during rehearsal not wanting to ‘waste’ any chance of a good suntan. Choristers are always instructed not to wear strong perfume and deodorant sooooooooooo! But the beautiful thing about singing in an international choir like this is that, even though we did not all speak the same language, we could sing with one voice! The sopranos – always in a state of undress – that’s me – the only one in a dress! * 3,000 choristers in our voice parts, queuing up in four stations around the arena waiting to register – usual Italian chaos ensued. Suddenly after about an hour and a half, us sopranos heard the bored basses, from the other side of the arena, start to sing “Va Piensero” – the song of the Hebrew slaves from Nabucco. Now all of us had learned this as a party piece to sing at a gala dinner to be held later for Pavarotti and guests of honour. What I didn’t realize was that this is the unofficial national anthem of Italy – and everybody knows it. Unseen, but heard by us from all points around the arena, the tenors joined in, then the altos and finally us sops let rip. But, what also happened is that the traffic stopped and every Italian around us stood up and joined in. It was a truly spine tingling moment and one I will never forget. 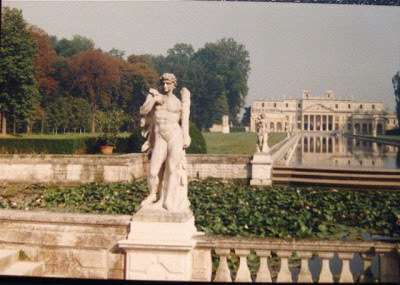 * Having a day off and sailing up the Brenta Canal from Padova, past the Villa Pisani and Villa Malcontenta, having a seafood lunch and then sailing out into open water and arriving in Venice and the Grand Canal by sea. I found Venice to be heavenly. 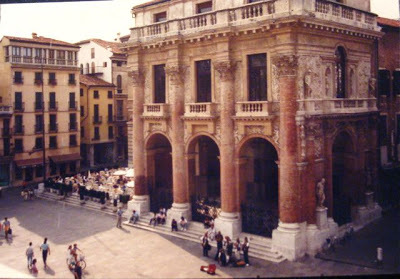 * Another wonderful day out in Vicenza and discovering Palladio and la dolce vita – and shopping, shopping. * Taking a break from rehearsal and a prosecco in Verona’s Piazza Bra and watching three handsome young men collectively turn their heads – like ventriloquists dummies. I thought, for sure, they had spotted some young attractive girl, but no – they were watching an elegant, smartly dressed woman in her sixties (the age I am now) walk down the street. What they were appreciating, now matter how old she was, was her beauty – ageless – and I realized it was something that Anglo Saxon men just don’t seem to have an appreciation for – sigh…………! * After the last concert in Verona with the Moscow Philharmonic out on the tiles in their very dated dinner suits full of gravy stains and cigarette holes – playing like angels on their violins, dancing on the tables and drinking copious amounts of vodka – what a party! We were quietly told by our choirmaster that if we could afford it we should ‘shout’ the Russians because they had absolutely no money – and shouted we did. * The sound of those 3,000 voices! I was walking on air for months afterwards on the three beautiful pairs of shoes I bought. TOP TIP: If you have any of this chicken dish leftover you can make a ragu out of it and have it with pasta the next day. Just strip the chicken from any bones, add a splash of dry white wine and some extra tomato and cook for a further 15 mins – I added mushrooms too. Adjust seasoning and sprinkle with parmesan and a little chopped parsley – and put on Verdi’s Requiem while you’re doing it.